Coenoclines are, according to the Oxford Dictionary of Ecology (Allaby, 1998), "gradients of communities (e.g. in a transect from the summit to the base of a hill), reflecting the changing importance, frequency, or other appropriate measure of different species populations". In much ecological research, and that of related fields, data on these coenoclines are collected and analyzed in a variety of ways. 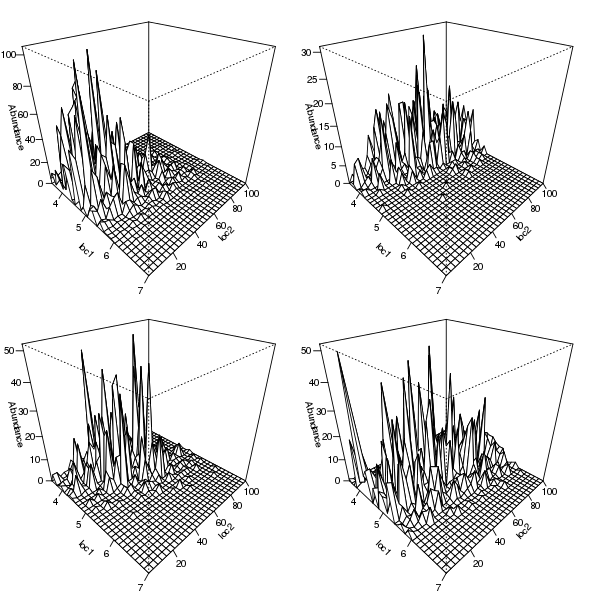 When developing new statistical methods or when trying to understand the behaviour of existing methods, we often resort to simulating data with known pattern or structure and then torture whatever method is of interest with the simulated data to tease out how well methods work or where they breakdown. 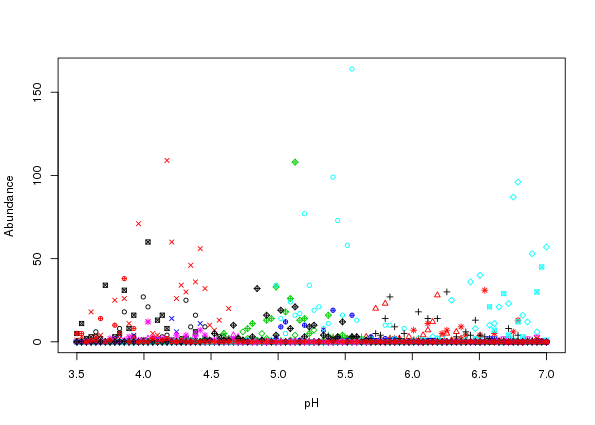 There's a long history of using computers to simulate species abundance data along coenoclines but until recently no R packages were available that performed coenocline simulation. coenocliner was designed to fill this gap, and today, the package was released to CRAN. You can find the source code on github and report any bugs or issues there. In the remainder of this posting I give an overview of coenocliner and show three examples illustrating features of package. As indicated, some parameters are only supplied once per species, regardless of whether there are one or two gradients. Hence for the Gaussian model, the parameter h is only supplied for the first gradient even if two gradients are required. Note that parameter \(h\) is not specified in the second set as this parameter, the height of the response curve at the gradient optima, applies globally --- in the case of two gradients, \(h\) refers to the height of the bell-shaped curve at the bivariate optimum. Notice also how parameters are specified at the species level. To evaluate the response curve at the supplied gradient locations each set of parameters needs to be repeated for each gradient location. Thankfully coenocline() takes care of this detail for us. Additional parameters that may be needed for the response model but which are not specified at the species level are supplied as a list with named components to argument extraParams. 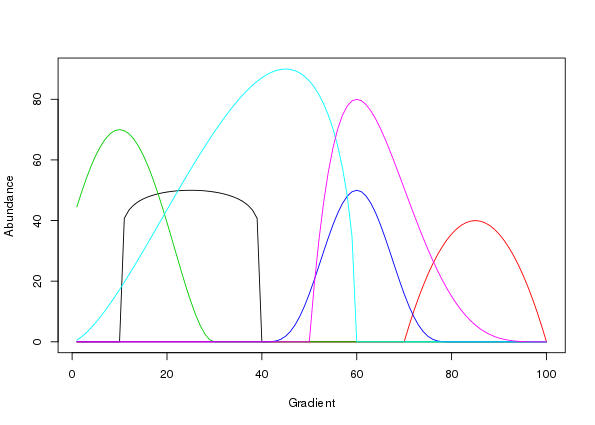 An example is the correlation between Gaussian response curves in case of two gradients. This, unfortunately, means that a single correlation between response curves applies to all species1, and is caused by a poor choice of implementation. Thankfully this is relatively easy to fix, which will be done for version 0.2-0 along with a fix for a similar issue relating to the statement of additional parameters for the error distribution used (see below). Some of these distributions (all bar "poisson" and "bernoulli") require additional arguments, such as the \(\) parameter for (one parameterisation of) the negative binomial distribution. These arguments are supplied as a list with named components. Again, due to the same implementation snafu as for extraParams, such parameters act globally for all species2. The final argument is expectation, which defaults to FALSE. When set to TRUE, simulating species counts or occurrences with error is skipped and the values of the parameterised response curve evaluated at the gradient locations are returned. This option is handy if you want to look at or plot the species response curves used in a simulation. In the next few sections the basic usage of coenocline() is illustrated. The resultant plot is shown in Figure 1. 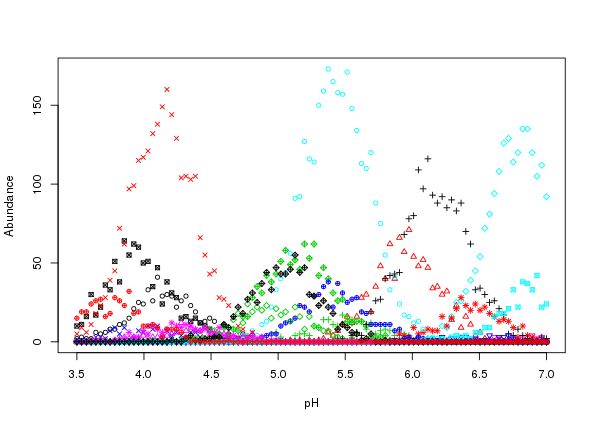 As this looks OK, we can simulate some count data. The simplest model for doing so is to make random draws from a Poisson distribution with the mean, \(\), for each species set to value of the response curve evaluated at each gradient location. Hence the values in mu that we just created can be thought of as the expected count per species at each of the gradient locations we are interested in. To simulate Poisson count data, use expectation = FALSE or remove this argument from the call. To be more explicit, we should also state countModel = "poisson"4. The resultant plot is shown in Figure 2 above. 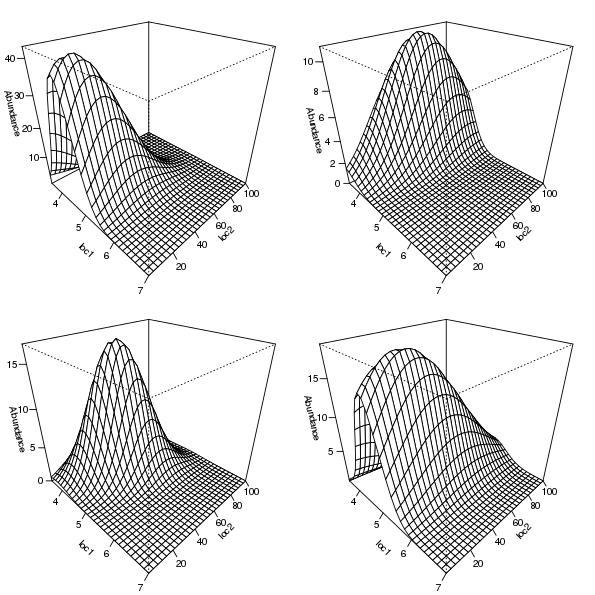 Whilst the simulated counts look reasonable and follow the response curves in Figure there is a problem; the variation around the expected curves is too small. This is due to the error variance implied by the Poisson distribution encapsulating only that variance which would arise due to repeated sampling at the gradient locations. Most species abundance data exhibit much larger degrees of variation than that shown in Figure . A solution to this is to sample from a distribution that incorporates additional variance or overdispersion. A natural partner to the Poisson that includes overdispersion is the negative binomial. To simulate count data using the negative binomial distribution we must alter countModel and supply the overdispersion parameter \(\alpha\) to use5 via countParams. Figure 4: Generalised beta function species response curves along a hypothetical environmental gradient recreating Figure 2 in Minchin (1987). Figure 4 is a good facsimile of figure 2 in Minchin (1987). In this example I illustrate how to simulate species abundance in an environment comprising two gradients. Parameters for the simulation are defined first, including the number of species and samples required, followed by definitions of the gradient units and lengths, species optima, and tolerances for each gradient, and the maximal abundance (\(h\)). Notice how the parameter sets for each gradient are individual matrices which are combined in a list, pars, ready for use. Also different this time is the expand.grid() call which is used to generate all pairwise combinations of the locations on the two gradients. This has the effect of creating a coordinate pair on the two gradients at which we'll evaluate the response curves. In effect this creates a grid of points over the gradient space. 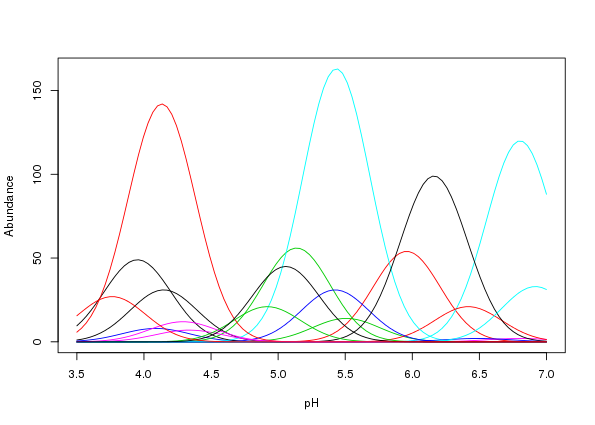 Figure 5: Bivariate Gaussian species responses for four selected species. The selected species response curves are shown in Figure 5. Figure 6: Simulated counts using negative binomial errors from bivariate Gaussian species responses for four selected species. Allaby, M. (1998). A dictionary of ecology. second. Oxford University Press. Minchin, P. R. (1987). Simulation of multidimensional community patterns: Towards a comprehensive model. Vegetatio 71, 145–156.